L-R: Paula Schwoerer, Paul Chase, David Cook, Mike Taimi, Jacob Schwoerer, Jeff Thomas, Justin Thomas, Bill Schwetke, Barry Schwoerer, Joe Dooley, Vern Eubanks. 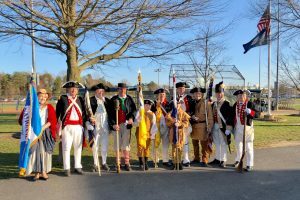 Patriots of the American Revolution were well represented at the opening ceremony of the baseball game between the Potomac Nationals and the Wilmington Blue Rocks. Four chapters of the Virginia Society Sons of the American Revolution provided eight men in Revolutionary War soldier uniform, three carrying muskets, one a cannon ram and three bearing flags. A member of the Elizabeth McIntosh Hammill Chapter of NSDAR carried the DAR Flag. The Colonel William Grayson Chapter, Children of the American Revolution, had two representatives who each bore a flag. Each of the participants is a descendant of one or more Patriots of the American Revolution. To be a Patriot of the American Revolution a man or woman had to either serve in a military unit, a qualifying civil office, or provided supplies or money to the Revolutionary cause.